Investigating the overall brightness of planets (and moons) provides insights into their envelopes and energy budgets. Phase curves (a representation of the overall brightness versus the Sun–object–observer phase angle) for Titan have been published over a limited range of phase angles and spectral passbands. Such information has been key to the study of the stratification, microphysics and aggregate nature of Titan’s atmospheric haze and has complemented the spatially resolved observations showing that the haze scatters efficiently in the forward direction. Here, we present Cassini Imaging Science Subsystem whole-disk brightness measurements of Titan from ultraviolet to near-infrared wavelengths. The observations show that Titan’s twilight (loosely defined as the view at phase angles ≳150°) outshines its daylight at various wavelengths. From the match between measurements and models, we show that at even larger phase angles, the back-illuminated moon will appear much brighter than when fully illuminated. This behaviour is unique in our Solar System to Titan and is caused by its extended atmosphere and the efficient forward scattering of sunlight by its atmospheric haze. We infer a solar energy deposition rate (for a solar constant of 14.9 W m−2) of (2.84 ± 0.11) × 1014 W, consistent to within one to two standard deviations with Titan’s time-varying thermal emission from 2007 to 2013. We propose that a forward scattering signature may also occur at large phase angles in the brightness of exoplanets with extended hazy atmospheres and that this signature has a valuable diagnostic potential for atmospheric characterization. discotic cores in 1-D semiconductor and charge migration. In past decades many breakthroughs have been witnessed in research on liquid crystals (LCs) and the application of LCs has spread. On another side graphene is considered as a rapidly rising star on the horizon of materials science, soft condensed matter physics and promising applications. Supramolecular chemistry of LCs and graphene together is described as “chemistry beyond the molecule”. A new class of 2D colloidal graphene oxide liquid crystalline material consisting discotic liquid crystallinity and their interactions with LCs present a platform for number of versatile properties and applications. This review focuses on discotic liquid crystalline (DLC) behavior of graphene oxide/reduced graphene oxide in various solvents, their characterization and application for energy storage, wet-spinning fibers, electro-optical devices, and displays etc. In the first part of this review, a brief introduction of discotic graphene oxide liquid crystals (GOLCs), their fundamental, synthesis process, supramolecular structures of graphene-DLC composites is highlighted. In the second part, some important physical studies and application of this largest polycyclic aromatic core of DLCs are discussed. Finally, an outlook on this emerging two dimensional material in liquid crystal field with relevant scientific application background is presented. Playing video games is a popular leisure activity among children and adults, and may therefore potentially influence brain structure. 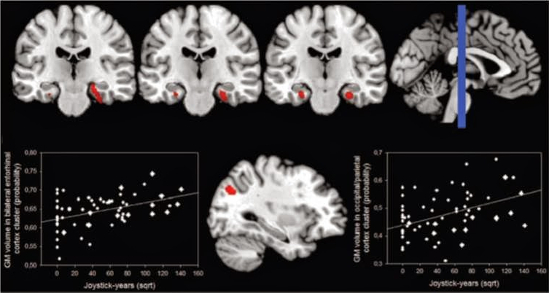 We have previously shown a positive association between probability of gray matter (GM) volume in the ventral striatum and frequent video gaming in adolescence. Here we set out to investigate structural correlates of video gaming in adulthood, as the effects observed in adolescents may reflect only a fraction of the potential neural long-term effects seen in adults. On magnetic resonance imaging (MRI) scans of 62 male adults, we computed voxel-based morphometry to explore the correlation of GM with the lifetime amount of video gaming (termed joystick years). We found a significant positive association between GM in bilateral parahippocamal region (entorhinal cortex) and left occipital cortex/inferior parietal lobe and joystick years (P<0.001, corrected for multiple comparisons). An exploratory analysis showed that the entorhinal GM volume can be predicted by the video game genres played, such as logic/puzzle games and platform games contributing positively, and action-based role-playing games contributing negatively. Furthermore, joystick years were positively correlated with hippocampus volume. The association of lifetime amount of video game playing with bilateral entorhinal cortex, hippocampal and occipital GM volume could reflect adaptive neural plasticity related to navigation and visual attention. Video gaming is a highly pervasive activity, providing a multitude of complex cognitive and motor demands. Gaming can be seen as an intense training of several skills. Associated cerebral structural plasticity induced has not been investigated so far. 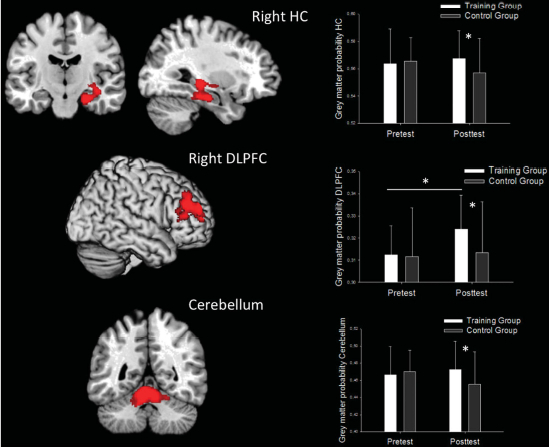 Comparing a control with a video gaming training group that was trained for 2 months for at least 30 min per day with a platformer game, we found significant gray matter (GM) increase in right hippocampal formation (HC), right dorsolateral prefrontal cortex (DLPFC) and bilateral cerebellum in the training group. The HC increase correlated with changes from egocentric to allocentric navigation strategy. GM increases in HC and DLPFC correlated with participants’ desire for video gaming, evidence suggesting a predictive role of desire in volume change. Video game training augments GM in brain areas crucial for spatial navigation, strategic planning, working memory and motor performance going along with evidence for behavioral changes of navigation strategy. The presented video game training could therefore be used to counteract known risk factors for mental disease such as smaller hippocampus and prefrontal cortex volume in, for example, post-traumatic stress disorder, schizophrenia and neurodegenerative disease. Read also: do you miss good old Joystick days? It really changed your life! Time travel has captured the public imagination for much of the past century, but little has been done to actually search for time travelers. Here, three implementations of Internet searches for time travelers are described, all seeking a prescient mention of information not previously available. The first search covered prescient content placed on the Internet, highlighted by a comprehensive search for specific terms in tweets on Twitter. The second search examined prescient inquiries submitted to a search engine, highlighted by a comprehensive search for specific search terms submitted to a popular astronomy web site. The third search involved a request for a direct Internet communication, either by email or tweet, pre-dating to the time of the inquiry. Given practical verifiability concerns, only time travelers from the future were investigated. No time travelers were discovered. Although these negative results do not disprove time travel, given the great reach of the Internet, this search is perhaps the most comprehensive to date.